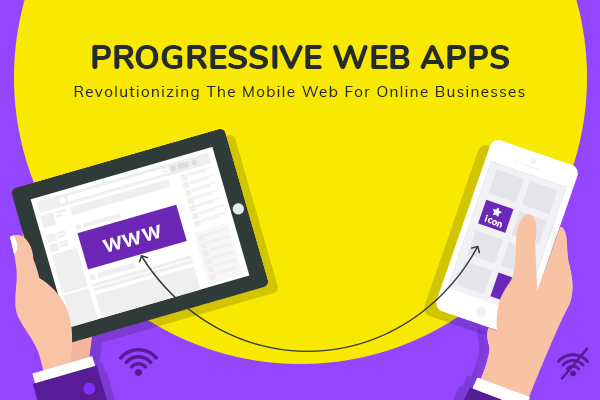 Why choose Progressive Web App (PWA) for your business in 2019? Simply put, a progressive web app is an application that can act like a mobile web page as well as a native app, all at the same time, irrespective of the device or the network service being used. The three core areas that a progressive web app focuses are reliability, speed, and engagement. A progressive web app loads instantly on different devices regardless of the network status. Besides a progressive web app enables an immersive full-screen experience on the home screen of the user without the need for an app store. It also helps you control how your app appears when launched, and you can also specify home screen icons, screen orientation and much more. Full-screen experience, splash screen, and push notifications are some of the features that a progressive web app shares with native mobile apps. Easy product-to-market: Unlike a mobile app, a PWA doesn’t need an app store support and since developers don’t have to worry about the various red tapes that they have to cross before getting your app published in a native app store, they can focus on the quality of the product instead. Just host your product on a web server and get it released instantly! Brand consistency: Since progressive web applications can work alike on all devices, whether it is a smartphone, a PC desktop or a tablet, it offers flawless user experience to your audience and helps your brand stay consistent within the internet ecosystem. Stay alive: As discussed before, a typical native mobile app tends to take up much space of your device’s storage space, not only when it’s first installed but also with the various updates released at later stages. This is when a user starts thinking of uninstalling apps from devices. Now, since a progressive web app doesn’t take much space as it is hosted on the web browser, any updates or changes made to it doesn’t affect the memory storage of a device. Also, even if a user wants to install your application on the homepage of a device, it still won’t require space as it is only the short-cut to your web app that gets saved. This makes a PWA a perfect means for you to keep your brand alive in the market. Sharing made easy: Sharing your brand online also becomes easy with a progressive web app, as it’s only a URL address one needs to share it via any message-sharing tool or device. SEO-friendly: According to a report by Connexity, more than 60 percent of searches for products and services are carried out through handheld devices, and it has been found that progressive web apps are indexed in more detail than any traditional mobile apps in most of the popular search engines. This gives your PWA-based product a definite edge in the online market arena. Cost-effective: Usually when it comes to developing mobile apps, development fees of native apps and the publishing of them in the respective app stores is a costly step. Since progressive web apps are cross-platform and don’t require the support of an app store, you can save a lot on development cost. Works offline: There come instances when an app is needed urgently but the user does not have an internet connection. Progressive web apps address this problem with its Service Workers feature that act as a network proxy, and whenever a page is requested, Service Workers tries to access that content from the cache. It is an age of cutthroat competition, making one’s business stand out of the typical clutter is a challenge faced by every business. Spericorn, being one of the most established web application development companies, understand and appreciate this need of yours to keep your brand and identity unique and take every effort to work together with you to achieve this goal. Our approach towards web applications development for businesses as distinctive as yours is to keep you also in the loop, right from creative conception to executing technical deliverables. Our tech-savvy team of dedicated professionals works together to deliver agile web-based, interactive & highly pragmatic solutions. We are a web application development company that focuses on delivering client-oriented development process, adhering to the specifications as directed. Customized solutions are provided through various steps including analyzing the market niche, branding, e-commerce, API development, and integration, generating the required content and testing. Our talented programmers work together in close association with our professional designers to deliver captivating websites. What more? As a web development company that believes in keeping our clients happy, we also take an uncompromising approach towards the maintenance and support services we provide.